A lovely walk on the fading purple moors above Blubberhouses visiting the modest summits of Lippersley Pike and Round Hill. Whilst flicking through some old pictures I came across a walk I’d done on the moors above Blubberhouses back in January 2011. On that occasion the views and photos I took were affected by hill fog and I afterwards wrote, “Despite the fog and the wet conditions underfoot I still enjoyed this walk and I definitely think I’ll try it again.” Well six and a half years later I finally decided I would indeed try it again. In all honesty I can’t think of a good reason why it has taken me so long to go back, after all the start of the walk is only a 15 minute drive from my house. Whilst I parked in Timble the first time I did this walk I shortened the route this time by parking on the west side of the crossroads leading to Timble from Sourby Lane. From the car I walked up the lane passing Sourby New Farm and Sourby Farm. After passing a small covered reservoir a short enclosed fork on the left brought me to access land and the first of many boundary stones I would pass on the walk. Keeping to the main track heading south-west for Ellarcarr Pike one boundary stone featured an Ordnance Survey benchmark, as did the boundary stone on Ellarcarr Pike itself. From Ellarcarr Pike I took a thinner path heading west through the fading purple heather. This path, called High Badger Gate, climbed gradually up on to Lippersley Ridge. The western end of Lippersley Ridge is called Lippersley Pike and is topped with an old cairn and a boundary stone engraved ‘1757’. Despite its fairly modest elevation of 332m Lippersley Pike is a rather grand place. There are sweeping views over Blubberhouse Moor to the north and the higher ground of Round Hill and The Old Pike to the north-east. To the south the view is dominated by Rombald’s Moor. From Lippersley Pike I took a thin path descending to Stainforth Gill Head and the first really soggy part of the walk. After negotiating a couple of bogs the path improved again on Gawk Hall Ridge. Soon after I came across a superb finger post inscribed ‘Ripon 12 miles, Ilkley 3 miles’. Clearly I was about to cross a path that was once much more trodden than it is now. Instead of turning right at the finger post to drop down to Gawk Hall Gate I instead crossed over the path to take a thinner path climbing up to Round Hill. This path was, apart from a particularly bad bog above Thatch Ling, fairly easy to follow. On the way up I was intrigued by a small area where the heather had been cropped and turned into miniatures bales. Passing a couple more boundary stones I passed through a gate to soon reach another gate on the right. Passing through this I double backed to the right to reach the small mound upon which the summit cairn of Round Hill can be found. The cairn is probably about half the size it was on my previous visit. The rest of the cairn seems to have been scattered in a dip in the moor immediately to the south of the cairn. The view from Round Hill is really quite extensive and stretches from Pendle Hill and the Bowland fells in the west to the North York Moors in the east. The finest aspect of the view however is the one looking north up Wharfedale. Rather than retracing my steps I instead descended on the east side of the wall and fence. An initially clear path soon faded though it was still easy enough to reach Gawk Hall Gate. The gate itself was in something of a sorry state and was hanging by its hinges. As I found on my previous visit the subsequent section of path between Gawk Hall Gate and Sun Bank Gill is not easy to trace. By aiming for the distant ‘golf balls’ of RAF Menwith Hill I managed to at least maintain the right direction. Just before crossing Sun Bank Gill I paid a quick visit to the large gritstone boulder called the Eagles Stone. I like to think it is named after the eagle standards of the Roman legions who once marched past this stone on the nearby Roman Road. The course of the Roman Road is not particularly easy to trace. This is even more the case now that a large track has materialised where there was once a thin path. This track ultimately led me all the way into the woods and plantations of Gill Becks. Here I had a little trouble following the path as marked on the map. As a result I cut through the woods to cross Gill Beck itself to join a path on its south bank. Turning left on this I then walked up a short enclosed lane to reach the access road to Low Wood Farm. Turning right I walked to the pasture above the farm, turned left and followed a succession of field paths back up on to the lane where I’d parked. All in all I really enjoyed this walk. The weather was vastly more improved than the first time I did this route. 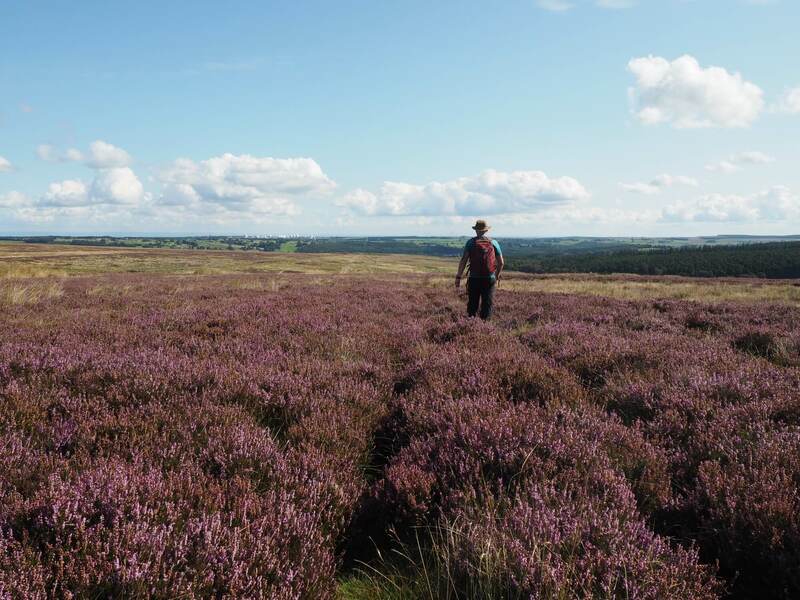 Although it was fading the purple moors were particularly beautiful. Definitely worth doing again, despite the odd navigational problems.